In this film Mickey and Minnie are farmers, which makes the film a little like a remake of ‘The Plow Boy‘ (1929). First we watch Mickey planting seeds with help from Pluto, and Minnie milking a cow. Then Mickey decides to scare Minnie by stepping inside the scarecrow. A string of gags leads to Mickey playing the bagpipes on three geese. This starts a musical number, which is almost Silly Symphony-like in its directionless musical fun at the barnyard. We watch cows, lamb, ducks, pigeons, turkeys and chickens moving and dancing to the tune of Turkey in the Straw. But then we cut to several chickens laying multitudes of eggs, except for poor Fanny. At this point suddenly a story develops, with Fanny laying an enormous egg, which attracts a lot of attention from her fellow chickens, the other animals, and finally, Mickey. Mickey rushes to bring his camera to make a picture of it, but unfortunately, he uses too much flash light powder, and everything explodes. This final gag was also used by Floyd Gottfredson in the Mickey Mouse comic strip, published on March 13, 1932. ‘The Musical Farmer’ is one of the weaker Mickey Mouse films of 1932. Like e.g. ‘Mickey Cuts Up‘ and ‘The Grocery Boy‘ it’s uses the part-musical-number-part-frantic-finale-formula, but by mid-1932 shots of dancing animals had become a bit tiring and old-fashioned. Moreover, Fanny’s story feels a little out of place, and I suspect that part of this film was intentionally designed as a Silly Symphony, which apparently never really took off. 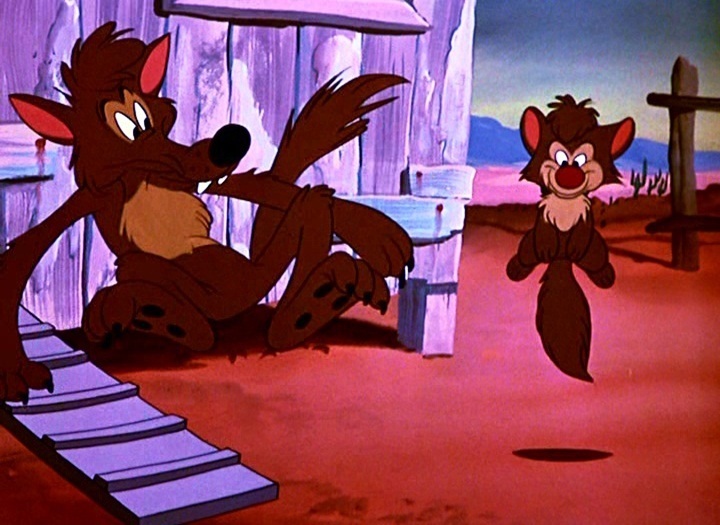 ‘Pests of the West’ is the second of three cartoons featuring the coyote Bent-Tail and his dopey son. In ‘Sheep Dog‘ (1949) they’d tried to steal sheep; this time the hungry duo is after the chickens. Pluto is only the straight man in a cartoon, which is devoted to the delightful interplay between father and son. Although not as classic as ‘The Legend of Coyote Rock’, ‘Pests of the West’ is a funny cartoon. The short is packed with gags, some being quite Tex Averyan, like the son hanging in mid air until his father knocks him down. However, its highlight is the great scene in which Pluto and Bent-Tail fight for a chicken. The wonderful and jazzy soundtrack enhances all the fun. It was composed by Paul Smith, who had been an arranger for Disney since the late 1930s, and would become a noteworthy composer on the studio’s True-Life Adventures.